If you are thinking of visiting Triumph site, pleasecontact usand we will help you to arrange your trip. 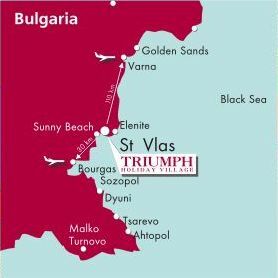 Triumph Holiday Village is located only 150 meters from the Black Sea coast in the city of St Vlas (Sveti Vlas), Bulgaria. In the summer months there are frequent flights to Bourgas airport, which is about a 25 minute drive to Triumph. It is expected that Bourgas airport will open up to scheduled flights by 2006 as part of the preparations for EU entry. Burgas Airport is currently served by international carriers and charter airlines from throughout Europe. Throughout the Winter there are scheduled flights from the UK and other EU airports to Varna. Travel distance from Varna is about a 90 minute drive to St Vlas and Triumph. The capital of Bulgaria, Sofia, is served by a number of airlines and would be about a 5 hour drive away. There is regular bus transport from Nessebar, Sunny Beach and Bourgas to Sveti Vlas, and plenty of private minibuses, route and ordinary taxis. There is also water transport to and from Nessebar and Bourgas to Sunny Beach.